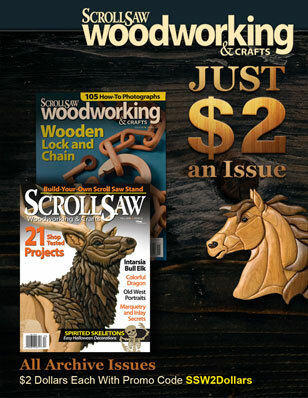 Experts estimate that 80 percent of scroll saw patterns from the turn of the century have been lost. Scrolling historian Ernie Lang decided to do something about that! Ernie has built more than 175 projects from turn-of-the-century plans and has recreated patterns for four scrolled works he found in museums and homes. Ernie’s passion for historic patterns led him to Louis Phillip Bachman, a regional woodworker who was quite active in the late 1800s. In his lifetime, Louis constructed nearly 100 barns, numerous houses and a large church. Louis embellished many of his projects with scroll saw work,cutting most of the decorative details on his homemade pedal scroll saw. When he was a young man, Louis cut—on the foot-powered saw—a Dome Clock project that would be daunting even by today’s standards. Louis’ surviving family, including grandsons Neil Bachman, George Keckand Allen Hoehn, and great-niece Lois Kasenter, shared the clock and other examples of Louis’ historic work with Ernie. Ernie travels the country documenting historic clocks; taking actual measurements when possible—to preserve the history and recreate useable scrolling patterns for future generations. While researching antique patterns,Ernie discovered the Allegheny-Kiski Valley Heritage Museum in Tarentum ,PA. The museum, sponsored by the A-K Valley Historical Society, is open Monday, Wednesday and Friday 9:00am-3:00pm and features several scrolled and fretwork antiques as well as an extensive collection of World War II artifacts, glass items and other artifacts from the Allegheny Valley in Western Pennsylvania. Admission is $3 for adults and $2 for children 12 and under. For more information on the museum, located at 224 East 7th Avenue, Tarentum, PA, visit their website, www.akvhs.org, or contact the historical society at 724-224-7666. 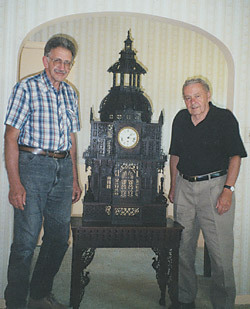 Louis Bachman’s grandsons George Keck(left) and Allen Hoehn (right) pose with the dome clock their grandfather scrolled on a pedal-powered scroll saw. In addition to building 175 projects from turn-of-the-century patterns, Ernie H. Lang has restored four patterns from items found in homes and museums. 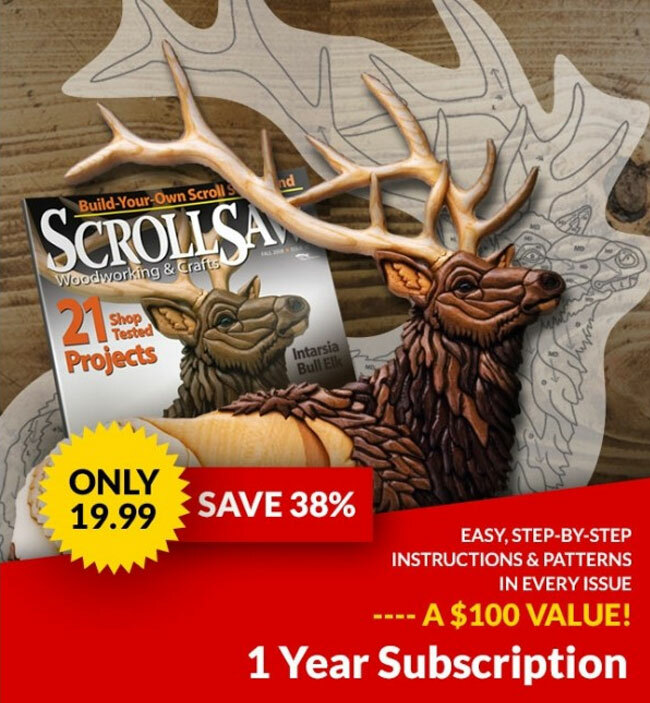 He has also worked out a deal with an Italian pattern company that has a large inventory of historic scroll saw patterns. 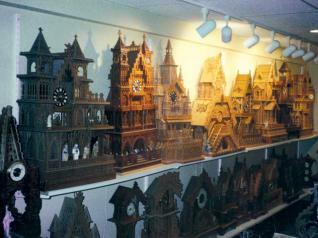 Another pivotal part of his collection is Louis P. Bahman’s foot-powered scroll saw. While researching historic projects, which Ernie recreates patterns for, he came across Louis. Louis started building barns as a teenager—and constructed nearly 100 barns in his life. He also built several houses and a large church, which he loved and attended. The church, St. Luke Lutheran Church, still stands today in Hannahstown, PA, which is about 30 miles north of Pittsburgh, PA. Louis also crafted a baptismal font, an altar, and a pulpit for the church. All the religious symbols on the front of the altar and pulpit were cut on his pedal scroll saw. Louis built the saw himself. The pulley mechanism produces a 1:7:3 ratio—so if the operator pedaled at a rate of 120 RPM, it would produce 876 blade strokes per minute. Blade tension was accomplished using a spring attached to the opposite end of the saw arms from the blade. A wing nut controls the tension. Blades are clamped in place by thumbscrews on top and bottom. In addition to building homes, barns and a church, Louis kept himself busy making intricate scroll sawed clocks, wall shelves, boxes, tables and parlor cabinets. One of the largest projects Louis built was the Grand Columbian Clock (now known as the Dome Clock). He built the clock in 1896, a year before he married Ida Barbara Frederick. The clock bears his signature, L.P. Bachman 1896, overlaid in the front base of the clock. Louis recycled most of his wood from old packing crates and other thin lumber. Most of the wood was pine or boxwood stained a dark walnut color. The soft woods were easy to cut, but had to be stained so all the wood would match. 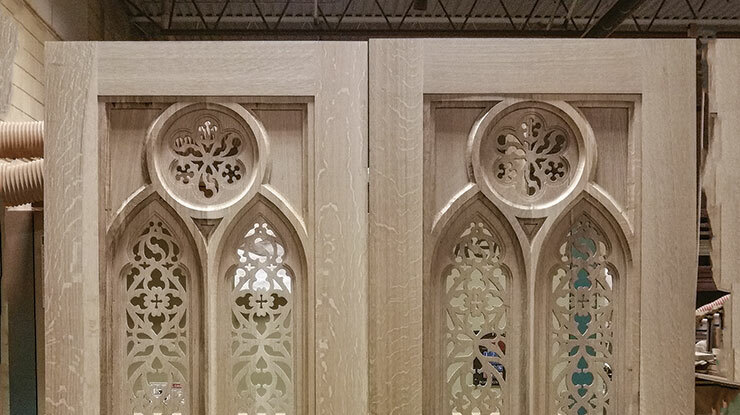 It is said that Louis’ sister Emma had the meticulous job of staining all the wood pieces after they were sawed. This would have been a very tedious job because of the many cutouts! Most of Louis’ work has been treasured as heirlooms by his surviving family. Ernie offered a special thanks to Neil Bachman, George Keck, Allen Hoehn, and Lois Kasenter for providing help and guidance during his research.